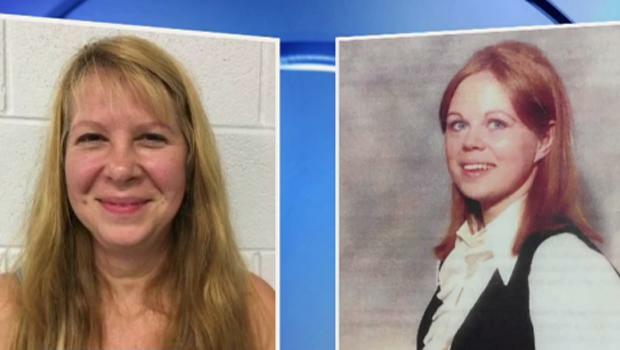 PALM BEACH COUNTY, Fla. -- Details emerged Thursday about a woman arrested in a 1990 "killer clown" Florida cold case slaying -- and her relationship with the victim's husband, who she later married. The Palm Beach County Sheriff's Office says 54-year-old Sheila Keen Warren was arrested Tuesday near her Virginia home. A Florida grand jury recently indicted her on a first-degree murder charge. Police have long suspected Keen Warren of being the person who in May 1990 dressed up as a clown, knocked on the door of a Wellington, Fla. home carrying flowers and balloons, and shot dead the woman who answered the door, Marlene Warren. But officials say they didn't have enough evidence to charge Keen Warren in the case until now. A detective said the sheriff's office in 2014 received a grant and had been reviewing a number of unsolved murders, including Marlene Warren's. It was recent advancements in DNA technology that allowed for the break in the case, but detectives Thursday wouldn't detail where the DNA was found or how they linked it to Keen Warren. Without the new evidence, they likely would not have been able to convince a jury of Keen Warren's guilt, they said. "You basically get one shot and if you roll the dice and take that chance and she is found not guilty, you never get that chance again," said Sheriff's Detective Paige McCann, who headed the investigation. "Sometimes patience is the best." The detectives who were giving the case a fresh look also learned that in 2002, Keen Warren had married the victim's husband, Michael Warren. A cold case detective said several witnesses told police that Keen Warren -- then Sheila Keen -- and Michael Warren were having an affair. Both, however, have denied that they were romantically involved at the time of the 1990 murder. Michael Warren reportedly owned Bargain Motors, a West Palm Beach auto dealership, and the suspect worked for him repossessing cars. The Sun Sentinel reports the two, both married to others, often took long lunches. The suspect separated from her first husband Richard Keen in January 1990 after a three-year marriage, the paper reports. After that, Michael Warren reportedly paid her rent. After the slaying, detectives say, they found evidence pointing to the then Sheila Keen, but not enough to charge her. Costume shop employees identified her as the woman who had bought a clown costume a few days before the murder. And one of the two balloons - a silver one that read, "You're the Greatest" - was sold at only one store, a Publix supermarket near her home. Employees told detectives a woman who looked like the suspect had bought the balloons an hour before the shooting. The presumed getaway car was found abandoned with orange, hair-like fibers inside. The white Chrysler convertible had been reported stolen from Michael Warren's car lot a month before the shooting. She allegedly told her mother, "If anything happens to me, Mike done it." Michael Warren was convicted in 1994 of grand theft, racketeering and odometer tampering and served almost four years in prison. After Michael Warren and Keen Warren married in 2002 they settled in rural southwest Virginia, in the Blue Ridge Mountains close to the Tennessee border. They had until late last year operated a popular drive-thru restaurant called the "Purple Cow" in Kingsport, Tenn., reports the Sun Sentinel. "These people pretty much tried to stay off the radar," Washington County, Virginia prosecutor Joshua Cumbow told the Sun-Sentinel. Michael Warren was with his now wife when she was arrested near their Abingdon, Virginia home on Tuesday and was on Wednesday re-interviewed in the case, police say. He has not been charged, but police refused to rule him out as a suspect. Detectives vowed to "work diligently" to determine if anyone else was involved in the slaying. Palm Beach County Sheriff Ric Bradshaw said on Thursday the arrest demonstrates that his office is committed to closing their some 300 cold case slayings. "To the families -- we won't forget about you," Bradshaw said. "And to the people who perpetrated this, we're gonna come and get you." Keen Warren on Wednesday waived extradition and is reportedly expected to be returned to Palm Beach County to face the murder charge within 10 days. McCann, the lead detective, said Keen Warren seemed "nonchalant" after the arrest. McCann said she wasn't surprised Keen Warren was pictured smiling in her mugshot. Sheila Warren's Virginia attorney, Wayne Austin, said: "She looks forward to having her day in court." Her husband did not return a call to his home. Neighbor Rocky Blevins told the newspaper Sheila Warren is "a great person," and his wife, Brook, said: "It has to be a mistake." The mother of victim Marlene Warren, 87-year-old Shirley Twing, first learned of the arrest when she was contacted by a Sun Sentinel reporter at her home in Las Vegas Tuesday, the paper reports. She was shocked to hear the man to whom her daughter was married when she was killed is now the husband of the suspect in her murder. "He married the killer?" Twing reportedly said. "Son of a gun."